Are Lush Hair Products Worth The Money? Something that I’m making a big effort to do in life is to choose more cruelty-free products, and towards the end of last year I switched the majority of my hair care to Lush products. I made this change for a number of reasons. Firstly, my hair needed a major shake-up; I had to wash my hair everyday to avoid dealing with major grease issues, and secondly, I found that I was going through so much shampoo and conditioner, and probably over-using them, adding to the grease issue. Switching to Lush products wasn’t exactly difficult, I mean, y’all know I’m a major Lushie, and I’ve used some of the products before, plus I was pretty excited to make this change to cruelty free and also cut down on the amount of chemicals going into my hair. Now we all know that Lush products can cost a pretty penny. This has never really bothered me as I’ve always seen Lush products as a treat, and let’s face it, you can’t expect to pay Primark prices for handmade, cruelty-free high quality items, but I must admit that the thought of forking out for these on a regular basis had me a little concerned. But here’s the thing: I’ve hardly bought any. The switch has really been a win win scenario for me. Not only are the products so much better for my hair that I’m not having to wash it nearly as often, but I’m also being more careful about the amount of product that I’m using – partially due to be cautious of cost! So what am I using and what am I spending? Psst! Shampoo bars have no packaging, so make for a much happier environment! Rub Rub Rub – one of my favourite little Lush hacks is using my favourite shower scrub to clean my hair every now and then. Every 2-3 weeks, I’ll do a wash with a handful of this seasalt body scrub, and the results are fantastic. I’ve bought a few tubs of this, but I use more of it on the rest of my body than I do my hair! So when your typical bottle of shampoo or conditioner costs £2-5 (and we all know that the conditioner runs out much quicker than the shampoo! ), and lasts a month or two depending on how much you use it, I don’t actually think there’s that much of a difference in the amount of money I’d be spending on the market leading brands, and I’ve really noticed a difference! I used to have to wash my hair daily, or risk a greasy second day, and now I can quite happily go 2-3 days between washes, and my hair just generally feels so much lighter and cleaner! Let’s just say, I’m not gonna be changing back! You all know I’m a huge Lushie – I hardly keep it a secret. My bathroom is overrun by black pots and bottles of my favourite goodies, as well as my little stash of bathbombs and bubble bars, and despite this, I’m still always wanting to buy more. One of the best things for me about trying new Lush products, is having a play around with them and finding different or more unusual ways to use them in my daily routine, and I’ve got a few to share with you today! Crazy as it sounds, I swear by using this shower scrub in my hair. I probably do it at least once every two weeks, and while it seems totally weird to get that rough, salty concoction into your locks, it does such a good job of giving your hair a good deep clean. I use it either after shampooing, or as a stand-alone hair washing product! While I adore so many of the shower jellies, I can find them a nuisance to use without dropping them on the floor and losing half of it down the drain. Instead of slipping around, grab yourself a little chunk, stick it into a loofah and use the friction from that to work it up into a good froth of body washing goodness! Refresher is my fave to do this with! Lush’s own dry shampoo, No Drought, doesn’t do all that much for my hair, but I do keep my bottle of Fairy Dust dusting powder in my handbag for emergency dry shampooing needs. I find it does a better job of covering any greasy looking roots, and its got glitter in it, need I say more? I’m also super curious to try this with other dusting powders! My favourite toner also works great as a relaxing pillow spray. Its seaside scent makes me feel like I’m drifting off to sleep after a day on a beautiful beach! Ever discovered your own Lush hacks? Drop me a comment as I’d love to give them a try! PS. If you’re looking for a new tip or trick, ask the staff in your local store – they’re full of knowledge! 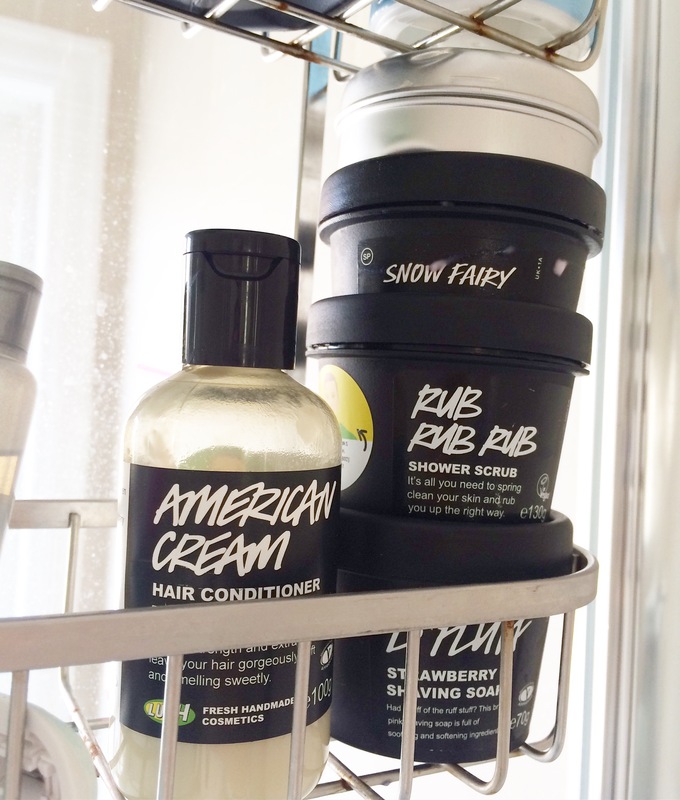 When you discover a brand that ticks all the boxes for you, its very easy to fall in love with every product that hits the shelves, and this fact doesn’t get much more accurate than when it comes to Lush. Every new shower jelly and bath bomb that drops instantly becomes a new obsession, and I don’t think I can be the only person who defines the seasons based on whether I’m stocking up on Snow Fairy or Unicorn Horns. Personally, there’s nothing I love more than trying out as many different products as I can, but over the years, there have, controversially, been a few products that just haven’t met my expectations.. This pretty pink Valentine’s Day exclusive is something that I bought for the first time a few weeks ago. I’ve seen it featured in favourites posts of many bloggers, so I figured why not test it out – I mean, its pink! To be honest, the scent just doesn’t do that much for me, and I’m sorta glad I only bought the smallest size of bottle..
As a person who swears by shampoo bars, I was really disappointed in my experience with this one. Admittedly, its probably just due to my hair type, but for something that smells SO GOOD, I was sorta hoping to love it. I know that this is a classic for many Lushies, but I CANNOT stand lavendar.. I got this as part of a gift box, and its definitely not something that I’ll be buying myself. Could just be my skin type, but it leaves my hands feeling quite greasy and oily, and the smell doesn’t really do it for me either. I want so badly to like this product, I just don’t.. Maybe I had a duff batch, but the consistency doesn’t seem right and its almost impossible to apply, and only seems to making shaving my legs more of a chore than it normally is! Are there any products that don’t do it for you? I’m curious! The last month of the year is almost over, and I think we’re all welcoming 2017 with open arms, but before we do, I’m gonna sneak in a last bit positivity with my final favourites of 2016. I bought a bottle of Fairy Dust way back in October when the Christmas range was first released, but its only really become part of my daily routine in the last month or so and I’ve loved experimenting with different ways to use it, including as a dry shampoo, and also mixing it with my face powder to make myself sparkle! I teamed up with the guys over at DisneyLife UK to offer readers a free 7 day trial of the programme, which I also signed myself up for and I’ve been filling my free time with some of my favourite live action movies and the Disney Channel Originals from my childhood. Not even ashamed to admit to the fact that I’ve seen Rogue One in the cinema twice already, and its not even been out for two weeks. As well as the film being totally amazing, I just love the atmosphere and hype when a new SW film comes out – suddenly the whole world becomes obsessed and its great! Gave into my basic blogger instincts when I found these copper lights in Asda for £5, and you’ve probably seen them in every blog and Instagram photo since. I have no shame, and I think they’ve added a little something extra to my blogography. Almost a year after I killed my Fitbit Zip in the washing machine, I treated myself to the Charge 2. It does everything I need it to as a fitness tracker, but I’m also finding my sleep habits super interesting and the silent alarms and guided breathing sessions are fab. Another year done, and tomorrow I’ll be looking back on some of the incredible things I’ve been lucky enough to do this year, so stay tuned! I’ve been talking a lot recently about seasonal Lush products, so I thought today I’d share with you the bog-standard (if you can even call them that!) items need near constant replenishment for me! Jumping Juniper was actually one of the first Lush products I ever tried, and although I’ve tried a few other shampoo bars, this is the one that does it for me! Combined with American Cream, its a total game-changer. I used to think my hair was ‘difficult’ because I had to wash it every day to keep it looking nice, but these two have my hair looking great for 2-3 days at a time, and I don’t get that greasy full-of-product feeling that regular branded shampoo and conditioner give me. This is everything! Its a scrub, but it also foams up and its got great moisturising qualities, it smells amazing and works wonders! As well as using it on my body, once every 1-2 weeks I’ll also use it in my hair as an alternative to conditioner – might sound crazy but I love it! I love The Comforter everything, but as I’m more of a shower person than a bath person, the shower gel means I can enjoy the amazing smell every day. Its pink, its pretty and it smells like all things yummy! This is one of the prettiest bubble bars in my eyes, and as I’m a fan or fruity over floral, this is a bar I’ll reach for again and again. I’m also a bubble bar over bath bomb person! I don’t know how Lush do it, but they’ve made a bath bomb that simultaneously wakes me up and calms me down in Avobath. The avocado oil gets my skin feel super soft and moisturised and its just a great all-rounder. What are your go-to Lush products? When I did my huge Lush order a little while back, I finally bought a product that’s intrigued me for a while now, and that’s Toothy Tabs. I mean, we’re all brought up being taught how important it is to brush our teeth, and even as adults, tv adverts are full of toothpaste and electric toothbrushes, and dentists telling us what’s best for our teeth, so the thought of ditching the Colgate and Oral B, but still cleaning my teeth was a little weird. I figured if I was gonna try something different, I might as well go all out, so I chose Sparkle, which is lemon, grapefruit and black pepper – no more mint! Basically, you take a little tab, and crunch it up between your teeth. It starts to froth, and you start to brush! First impressions: TOTALLY STRANGE. For starters, not having that instant minty taste was really odd, and the pepper flavour took some getting used to, but once I got past that, I really started enjoying the tabs! Being a dry tablet, you don’t get as much froth as your regular toothpaste, but personally that didn’t bother me as I always find with toothpaste, I’ve spat most of it out within the first minute. The flavour is strange, especially with the pepper, and I like to rinse my mouth with water after I’m done brushing, but it is a fresh taste, and there’s no real aftertaste, so you don’t have to worry about your breakfast tasting weirdly minty. Despite being a total change from my regular toothpaste, I actually really like the tabs, and I actually think my teeth look cleaner directly after using them, which I don’t get with toothpaste. Other benefits, of course, are that they’re natural and cruelty free, but while I’d love to use them as a complete replacement to my regular toothpaste, my mum pointed out that they do lack in fluoride, which is important to prevent tooth decay, so while I probably use them 2-3 days a week, I’m not giving up normal tooth brushing. Would you give your toothpaste a break for these natural nibs?